(Mandeville, Louisiana) – Even in tough economic times, it’s hard to give away $10,000 - in pennies. To commemorate the 200th anniversary of President Abraham Lincoln’s birth in 1809 and the 100th anniversary of the familiar Lincoln cent first issued in 1909, rare coin dealer Paul Hollis of Mandeville, Louisiana will give away a million Lincoln cents in public places throughout Louisiana between Lincoln’s birthday, February 12, and February 24 at the Argus Mardi Gras parade in New Orleans. But it’s been harder than anticipated, and not just because the million one-cent denomination coins weigh about 5,500 pounds. “I’ve been trying for weeks to arrange for delivery of a million of the new, 2009-dated Lincoln cents that are scheduled to be released on February 12. Those would have the first of four new ‘tail’s’ side designs this year,” said Hollis. “Abraham Lincoln has always been one of my favorite Presidents and this is my small way of remembering his extraordinary legacy,” explained Hollis. In addition to those with new designs, some of the million pennies will be 50 to 90 year-old collectors’ coins with the original “wheat stalks” design on the tail’s side. According to the United States Mint, the four new designs on the reverse of the new pennies represent four major aspects of President Lincoln’s life: his birth and childhood in Kentucky; his formative years in Indiana where he worked as a rail splitter; his professional life in Illinois; and his Presidency in Washington, D.C. It’s the first major change in the cent since the Lincoln Memorial design was introduced a half-century ago in 1959. Hollis, 36, became a collector when he was six years old after receiving an old coin from his grandmother. 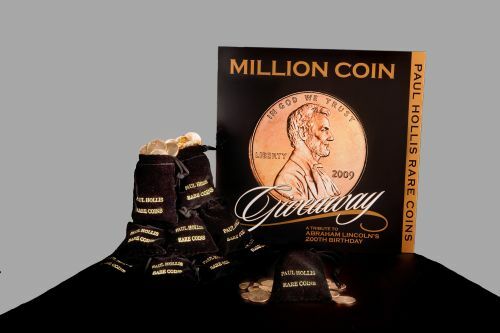 The approximately 2.7 (US) tons of coins will be given away by Hollis a handful-at-a-time with specially-made cloth coin “purses” that will be accompanied by an illustrated, educational brochure he produced explaining the history of the Lincoln cent. “How many people can say they gave away ‘tons of money’ and really mean it? I think this is great,” said Hollis. For more information or to receive a complimentary brochure, please visit Paul Hollis Rare Coins online at www.PaulHollis.com, or call (800) 994-0689.